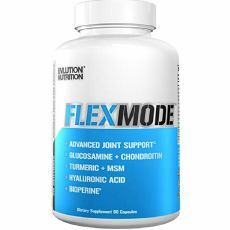 Flexmode is a dietary supplement that claims to be able to improve the range of motion and flexibility of the joints. The product seems to be geared towards weight lifters but can surely be used by anyone who want to improve the health of their joints. It is a gluten-free product that is intended to be taken orally as a pre-workout supplement to protect the joints when engaging in weight training or exercise, or as a standard dietary joint supplement. By utilizing the main ingredients glucosamine and chondroitin, this product may be able to improve the cushioning between the bones. It is billed as a joint pain reliever as well. We are also told that Flexmode may be useful to lubricate the joints and provide cartilage support. Please take note that Flexmode is a dietary supplement and is not meant to replace any medication you may be taking for serious joint diseases. Who is the Manufacturer of Flexmode? The manufacturer of Flexmode is a company called Evolution Nutrition. Evolution Nutrition is a company that makes a wide variety of pre and post workout supplements. They gear most of their products towards athletes and weight trainers but state that their products can be used by anyone. This product can be purchased from the official website as well as third party online retailers. The most prominent component of the Flexmode formula is glucosamine (there are 1,500 milligrams of it included in the formula) which has been studied by the American College of Rheumatology and has been found to improve the conditions of some people who suffer from osteoarthritis. Flexmode may also work safely because the same organization found that both chondroitin and glucosamine were safe to take long-term. Other workings of this joint pain relief product include an increased range of motion, joint recovery support after exercise and cartilage support. Flexmode ingredients – Are they Safe & Effective? At least half of the ingredients included in Flexmode are naturally occurring and unlikely to be harmful to the individual. The ingredients glucosamine and chondroitin have also been deemed safe by a leading authority on joint and bone health. Glucosamine Sulfate – This is included in many joint support supplements since there has been so many studies conducted on it. Glucosamine sulfate however is made in a lab and therefore may not be naturally occurring. Its main function is to cushion the joints. Chondroitin Sulfate – Chondroitin is found in connective tissue and cartilage. Again, the sulfate form of this component is usually harvested in a lab from animal tissue. It may reverse cartilage loss and provide shock absorption for the joints. Turmeric Root Powder – Turmeric root powder contains curcuminoids which are believed to possess very potent anti-inflammatory properties. Bioperine – Bioperine is actually a registered and patented form of black pepper fruit extract. It’s role in Flexmode and many supplements like it is to help the body absorb the nutrients present in any given formula. Boswellia Extract – This is an herbal extract that comes from the boswellia serrata tree. It has been used in various cultures to treat certain inflammatory conditions. In the case of Flexmode, it may serve to prevent joint inflammation. What are the Advantages of Flexmode? Flexmode may be able to help with joint stiffness and soreness. This product may be good to use after a workout to support quicker joint recovery and to avoid aches and pains. This product addresses inflammation in the joints. This product may also improve the joints’ range of motion. What are the Disadvantages of Flexmode? This product contains rice flour so it may cause some allergic reactions for some users. The turmeric dosage in Flexmode may result in some mild headaches or dizziness. The dosage is a bit high compared to some other similar products at three pills per serving. Flexmode is not suitable for vegetarians as it contains gelating possibly sourced from animals. How Should You take Flexmode? Flexmode is intended to be taken as a dietary supplement first and foremost. The recommended dosage is three pills a day. It is also recommended to take the pills with water and a meal or as otherwise instructed by a health care professional. How Much Does Flexmode Cost? The price of the Flexmode in the product’s official website is $19.99 for a single bottle (each bottle of this product contains 90 capsules or 30 servings). What is Flexmode’s Return Policy? If you buy directly from the official website, you can return this product if it arrives to your shipping address damaged. If you purchase from retail sites, the return policy is likely to vary. Does Flexmode Offer a Free Trial? There is currently no site offering a free trial of this product. This may change in the future however, so be sure to check back with us. The most important point about this product is that it is supposed to support the joints and keep them free of pain and inflammation. Flexmode may also benefit the long-term health of the user’s joints. There is no soy or dairy in this product which is good for those who suffer from allergies to either of these foods. While Flexmode may hold some advantages for joint health, especially for people who work out or body build on a regular basis, the addition of turmeric in the formula may result in some light headaches, dizziness, or nausea. Additionally, the serving size is a bit higher as opposed to similar products and therefore may be inconvenient for some user. In any case, you should always talk to a doctor or specialist before you start taking any supplement for your joints. 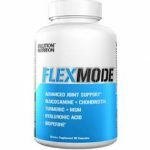 If you are considering Flexmode you should also take some time to compare it with other joint health supplements before making a final decision.